This desert in Valley of the Tsauchab, Namibia illustrates the vegetation, desert crust, and occasionally pooled water that characterize these arid regions. Annual rainfall in Namibia's coastal desert is 50 millimeters (about 2 inches). of life in these regions involves a constant struggle to obtain this limited commodity and to draw the maximum benefit from it. The world's deserts are divided into four categories. Subtropical deserts are the hottest, with parched terrain and rapid evaporation. Although cool coastal deserts are located within the same latitudes as subtropical deserts, the average temperature is much cooler because of frigid offshore ocean currents. Cold winter deserts are marked by stark temperature differences from season to season, ranging from 38°C (100°F) in the summer to minus 12°C (10°F) in the winter. Polar regions are also considered to be deserts because nearly all moisture in these areas is locked up in the form of ice. Several basic conditions distinguish between desert regions and others from a hydrological point of view. A few, often intensive, rain events with a low amount of overall precipitation, which causes most of the small rivers to be active only a few months every year, and sometimes only once every few years. Development of "desert crust" on the land surface. A thick vadose zone (the zone between the water table and the land surface) resulting in a deep water table. The salinization problems of both groundwater and soils. Vast areas of bare soils, low annual precipitation, and few high intensity rainfall events with high kinetic energy characterize arid zones. Bare soils exposed to rainfall are subjected to physical and chemical processes that change the hydraulic properties of the soil near the surface. When dried, a hard layer is formed in the soil surface that is often called "desert crust,"commonly enriched in calcite or silica. Desert crust decreases the infiltration rate of soils, thereby increasing runoff and soil erosion, reducing the availability of water to the root zone, and impeding seedling and plant growth. Understanding the formation and properties of such a crust, as well as developing engineering methods to break it, are essential to control the runoff-infiltration (recharge) ratio and to maintain successful agricultural activities. Vegetation may be the most important control on water movement in desert soils. Because vegetation in arid regions is opportunistic, when the water application rate is increased, plant growth increases as it uses up the excess water. The opportunistic nature of desert vegetation is shown by a significantly higher concentration of vegetation in areas of increased water flow, such as in ephemeral streams and in fissured sediments . Where the water supply is limited, plant activity decreases until the water-supply rate increases. The importance of vegetation on a local scale has been shown in several field studies. For instance, it was found that the presence of plants greatly reduced deep drainage in comparison to bare soils. In the past, studies of the unsaturated zone, or vadose zone, in arid settings were conducted primarily for water resources evaluation. In the last two decades of the twentieth century, however, emphasis shifted from water resources to waste disposal and the transport of contaminants . 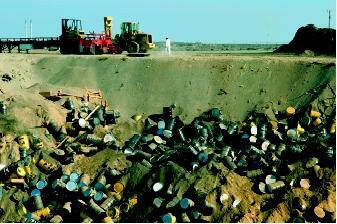 Arid areas are being proposed for low-level and high-level radioactive waste disposal. Most of the studies related to the vadose zone in arid settings were conducted in the western United States in regions that are designated as waste facilities. Some of these sites include Hanford, Washington; Sandia, New Mexico; Ward Valley, California; Eagle Flat, Texas; and Nevada test site and Yucca Mountain, Nevada. The increasing interest in the desert environment for waste facilities, in general, and radioactive waste, in particular, raises the need to understand the practical importance of preferential flow in the subsurface. One could assume that a thick vadose zone combined with low precipitation promotes the safest possible environment for waste disposal. However, fast flow via fractures, cracks, and macropores had been suggested as a major mechanism leading to contaminant transport much faster than anticipated by models that predicted transport based on average soil properties. 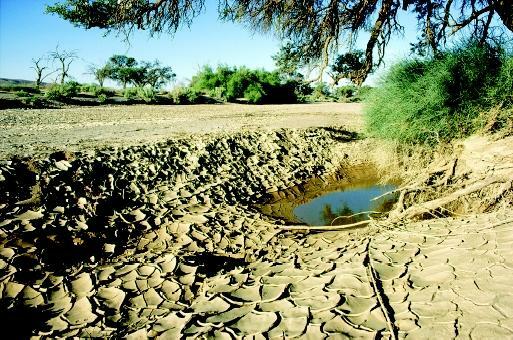 A significant issue to consider in arid environment is the salinization of both soils and groundwater. The low precipitation, combined with high evapotranspiration and often-slow flow rates in the subsurface , result in higher concentrations of salts. Human-induced salinization has a long history. A major source of salts accumulating in the upper vadose zone is irrigation water, which is essential for sustaining agriculture in arid lands. The Hanford site in Washington state is a disposal site for radioactive waste. Its location in the "rain shadow" east of the Cascades Range results in an arid climate and desert hydrology. More than one-third of the developed agricultural lands in arid and semiarid regions reflect some degree of salt accumulation. High salinity in agricultural lands imposes stress on the growing crops that can lead to decreased yield and in some cases complete crop failure. This problem emphasizes the need for careful management of desert land and water balance. Despite the difficulties for plants, animals, and humans to live in desert regions, they are increasingly being utilized because of pressure from world population growth. This problem is expressed in the expansion of agricultural activities onto desert lands as well as by the formation and rapid growth of urban and industrial centers. These trends not only result in a growing demand for usable water, but also for the increased disposal of vast amounts of wastewater and solid wastes (e.g., radioactive wastes, hazardous wastes, and municipal solid wastes). In several cases, international conflicts have developed due to water rights in arid regions. Large rivers crossing desert regions are often the only potential source for water that is essential for agriculture, industrial use, and drinking water. For example, the rights to use the water of large rivers in Africa (e.g., the Nile) and in the Middle East (e.g., the Euphrates and Jordan) remain one of the major issues that govern the relations and conflicts between the countries upstream, where most of the river water discharges, and the countries that use the river water downstream. Desalinization. Desalinization of either deep saline groundwater or sea water is an important alternative source for water in arid regions. However, the cost of desalinization remains higher than most other alternatives. A complex infrastructure is required, and the need for a close source of saline water makes this alternative impractical in many arid environments. The world's largest desalinization projects are in the Arabian Gulf (Saudi Arabia, United Arab Emirates, Kuwait), United States, and Japan; all which are wealthy countries with long seashores. SEE ALSO Artificial Recharge ; Hydrologic Cycle ; Hydropolitics ; International Cooperation ; Precipitation and Clouds, Formation of ; Radioactive Chemicals ; Runoff, Factors Affecting ; Transboundary Water Treaties . Issar, Arie S., and Sol D. Resnick. 1996: Runoff, Infiltration and Subsurface Flow of Water in Arid and Semi-Arid Regions. Water Science and Technology Library. Dordrecht, The Netherlands: Kluwer Academic Press. Scanlon, Bridget R., Scott W. Tyler, and Peter J. Wirrenga. "1997: HydrologicIssues in Arid Unsaturated Systems and Implication for Contaminant Transport." Reviews in Geophysics 35, no. 4, 461–490. Weisbrod, Noam et al. "Salt Accumulation and Flushing in Unsaturated Fractures in an Arid Environment." Groundwater 38, no. 3, 452–461. This is a good short article with impressives pictures about some of the aspects of hydrology of the desert areas. The local vegetation that has survived the harsh and extreme arid conditions need to be investigated and explored in detail. There are several beatiful trees and shrubs that have grown and multiplied by natural broadcasting and self regeneration in different desert environement through out the globe. It would be very useful to protect these species develop them and make efforts to grow them in larger areas.